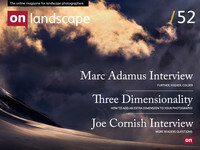 Just before Christmas we asked our readers for a bunch of questions that we could put to Joe Cornish when he visited next and the response was fantastic. In the end we recorded two hours of audio but to keep installments to a useful length (a lot of people say they listen to them over breakfast or during a commute) we’ve split it into half hour sections. So, a big thank you to Joe and everyone who submitted their questions and here’s the second section..
We've also included an incidental collection of snowy images to run alongside this item.